I among many others have always been ready to smash a kitten when a package shows up at the door with some absurd brokerage fee on top of my regular duties charges that I expect to owe. Well what if we didn't have to smash those adorable kittens and instead we taught our shipping companies a lesson in empowered thinking? Well my friends, I am going to tell you how to do that. First, lets talk about what a brokerage fee is, what duties are and how they effect all of us. Brokerage fees are what many shipping companies charge us to spend the time claiming the values of our goods to customs (The CBSA, Canadian Border Services Agency here in Canada). The respective border agency then tells the shipping company how much taxes we mus pay to bring our products in to the country. These government fees will be based on what state or province you live in, where the product was made and how much it is worth (strong words of advice, don't lie about this part. If they catch you, it hurts). The shipping company then slaps an invoice on your package but adds a "little" convenience fee on there because they did the work for you. Some companies are very minimal on these "convenience" or brokerage fees, but some feel that time is money and will make every hole on your body sting if at all possible. While postal services like Canada Post and USPS are known for their $5 flat rates (plus any duties owed), companies like UPS and FEDEX are committing highway robbery with fees up to and higher than $100 on many occasions. These costs are on top of any duties owed. That is flat out robbery. Many people usually avoid these fees by using their regular mail systems. 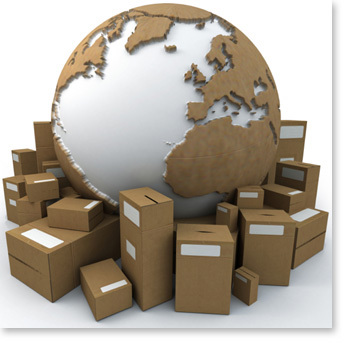 But there are many downfalls to this system, for example: Mail based shipping is significantly slower than most courier services, Tracking often doesn't work once the product crosses the border, Express shipping is grossly overpriced, rates of loss or damage are higher and many other reasons. Courier services like UPS and FEDEX are often much quicker and can some times be less expensive too, but you run the risk of these evil fees! If I were to ask for a show of hands as to how many people have received a package from UPS only to be hit with a bill equal to or more than the product they purchased, I probably wouldn't see any hands because you're reading this from all of your secret ninja hideouts on the internet. But I bet most of you did raise your hand. So we all hate this, we must see this stop, but how? Let me tell you. What if UPS didn't do the brokerage part of the deal? Well then they couldn't charge us for their efforts. What I am about to tell you will work in Canada, but I am not sure about anywhere else. I do however suggest that every one check with their respective customs agencies on their policies with brokerage. If this process sounds too hard, there are also many brokerage companies that operate on much lower flat rates than UPS (usually $10 or so). So below I am going to list out the steps, you must follow them fairly correctly or you wont succeed. Order a product online from your favourite cross-border retailer. Some things that may happen, but dont let this discourage you: UPS is known for telling you that you have to go to the port of entry (place where the package crosses the border) to broker the package. While not entirely untrue, you only need to do this if your package exceeds $1000 in value. UPS has also been known to tell people that they can not follow this procedure, they are lying when they say this. If you have issues, contact the CBSA. As I stated above, this process works in Canada, I cannot verify that for any other countries, but the rules are likely similar. Again, if this seems like too much work you should search the internet for some flat rate brokerage companies that will do the work for a much lower cost than the courier companies do. This process has been tried and tested, but many just don't know about it. Lets show these courier companies that we are smarter than them and wont let them charge us for not knowing any better. Don't forget to share your success stories and don't forget to apologize to your cat for contemplating the thought of using it as an outlet for your rage.